This is what I cook when I don't feel like cooking. All day yesterday I just did not feel like cooking. I knew I was going to make a chicken soup, but I needed something after the soup, as soup is just not enough for my family. You may be thinking you don't feel like cooking yet you are making a soup and something else, that's cooking. Chicken soup to me is like baking, once you put everything in a pot, it cooks itself, you don't do anything for 1 and 1/2 to 2 hours. I love when my family request soup, means an easy dinner to prepare for me. 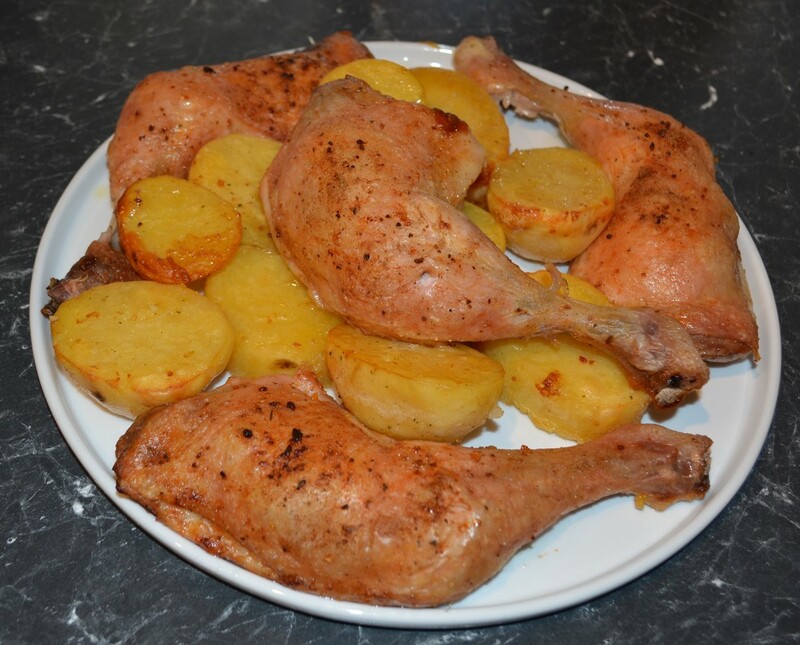 As for the baked chicken, it takes 10 minutes to prepare and then it bakes itself for one and half hours, dinner is done and you do very little. Yet the family is satisfied, you spend less than $10 on ingredients, far cheaper than take away chicken where I live. Now I only used 3 marylands, as we were having this after a soup, so I knew my kids would have a leg each and it would be enough. 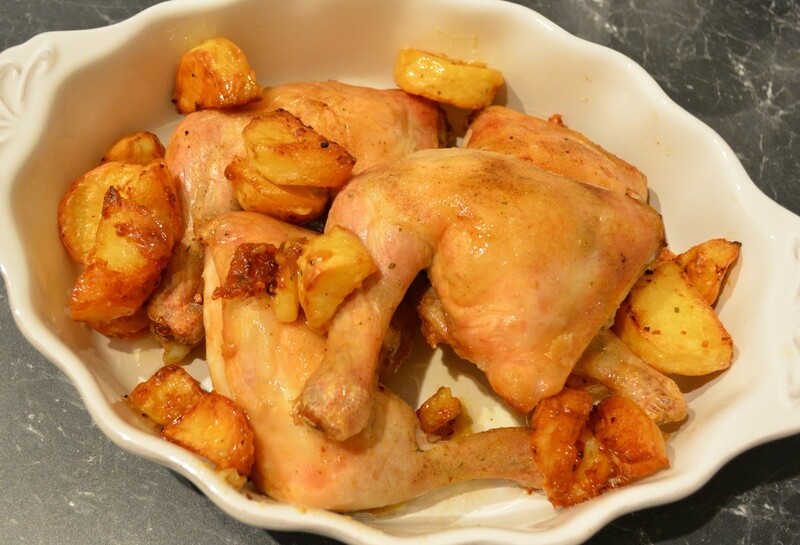 But add more chicken and potatoes if you are only baking this and use two trays to not overcrowd the potatoes. As for the vegeta it is a Croatian vegetable stock powder which I chose to use as a seasoning. The amount is a guide. I actually just lightly sprinkle it on the potatoes and chicken without measuring. Like you would with salt. So if you ever don't feel like cooking, try this, super easy and my 7 year old reckons the skin is baked to perfection-he cracks me up, he loves food with a passion. Preheat the oven to 200C/180C fan forced. Peel the potatoes, cut into medium-large chunks or into thick discs. Grease an oven tray with some rice bran oil (you need enough oil to cover the surface of the tray lightly). Scatter over the potatoes, do not overcrowd the baking tray, spread the potatoes out. Add the sliced onions between the potatoes. Sprinkle with half of the Vegeta, lightly drizzle over some extra virgin olive oil. Toss the potatoes around, leave three gaps where you will be placing the marylands. Season both sides of the chicken marylands with the remaining vegeta. Add them to the potatoes, skin side up, moving the potatoes around the marylands. Bake for 50 minutes-1 hour or until the chicken skin is crispy and the chicken is cooked through. Remove the chicken when ready. Bake the potatoes 10 minutes more if needed to be crispy. Serve with a green salad.